The scoop anchors are shaped like a shovel with a concave fluke. Remove a shovel’s handle and add an anchor shank and you have a scoop type anchor. Just like a shovel is designed to dig, so it is with a scoop anchor  it digs, and if you apply more pressure, it digs deeper. They represent one of the true breakthrough design advancements in the last decades in the marine industry. The design innovation was introduced in 1996 by a Frenchman, Alain Poiraud, with his Spade anchor. The scoop anchors are versatile and appropriate for use in many bottom types. As a group they are fast setting and deep penetrating anchors. Scoop anchors are designed to dig deeply into the bottom and are unlikely to roll out during a reversal. Being solidly constructed the scoop-type anchors, as a group, are on the heavier side. 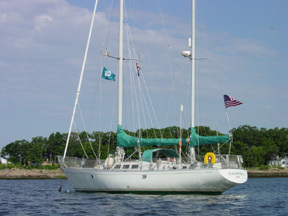 A deep-set anchor must fulfill several additional criteria to ensure high holding. The anchor must be stable, must not break-free in rotation, and the shape must allow the evacuation of materials backwards; if not, in certain grounds, a scoop-type anchor may become clogged and may break out by shearing out of the ground. In our experience, we have not had any of these problems; in fact, the more the wind blows, the deeper we see them dig even with reversal of wind direction. The one drawback of the scoop anchors is that you should preferably have a windlass and a wash down pump as well to use them practically as they invariably bring up loads of muck. Frankly, it’s a price we are more than willing to pay to keep our boat secure.